The SlackWater Center at St. Mary’s College of Maryland is a consortium of students, faculty, and community members documenting and interpreting the region’s changing landscapes. Oral histories are at the core of the center, which encourages students to explore the region through historical documents, images, literature, and scientific and environmental evidence. Some of this work has been published in the print journal SlackWater, some of which is online and some published here. The work below was first published in spring 2009 in SlackWater Volume VI: The Instant City. By J. Frank Raley Jr.
A lifelong resident of St. Mary’s County, J. Frank Raley was born in Park Hall in 1926. He served in the Maryland House of Delegates from 1955 to 1959 and the Maryland Senate from 1963 to 1966. Among other activities, he was instrumental in the creation of the Maryland Department of Economic Development and the Tri-County Council for Southern Maryland. In 1940, St. Mary’s County’s population was less than it was in 1795. Isolated on the southern tip of Maryland’s western shore, the county was one of the poorest in the state; young people who did not go into agriculture usually left the area to find jobs. The county had been a heavy user of slave labor for growing tobacco, and after slavery was abolished the county had turned to bootlegging and gambling. With the establishment of the naval base at Patuxent River in 1942, the whole socio-economic structure of St. Mary’s County began to change. The base provided opportunities for jobs at income levels never before experienced here. But even with the Navy’s extensive investment in building the base, the stability of the local economy remained uncertain. Once World War II ended and cutbacks were made at the base, the anxiety for permanency increased. Many base personnel worked in operational units that would suddenly transfer out, and the county’s economy would plummet. Because of uncertainty that the base would close, county government was reluctant to plan for and invest in infrastructure projects such as roads, schools, and utilities. In 1954, the population of St. Mary’s County was approximately 30,000 and still subject to sudden jolts due to Navy policy. The county, wary of change and tentative about the possibilities for economic expansion, did not understand that the Navy was beginning to consolidate its resources and shift away from operational functions to focus more on aircraft development and testing. Indeed, while the county feared economic downturns as naval squadrons transferred away from Pax River, in fact the opposite was occurring. Pax River was becoming a development and testing center, and economic expansion was underway. In this climate, the old county and its customs and economy were fading; they were being replaced with high-tech industry. While the county welcomed the money, it remained reluctant to invest in the infrastructure to support the Navy. County government failed to understand its role in building the infrastructure that would support further Navy commitments. To counter this reluctance, newcomers to the county became politically active. In 1954, Jack Daugherty, a former Marine flyer, rising businessman, and fierce entrepreneur, organized a group of candidates from the Lexington Park district to run as candidates for major county offices. As the slate’s leader, he himself ran for the state senate. Other like-minded candidates ran for the House of Delegates and the Board of County Commissioners. This ticket was seen by the old county as a threat from outsiders, and taken as a sign that a rebellion was underway and that efforts were being made to take control of county government. The “assault” sent spasms of fear through the county leadership. The Daugherty campaign was aggressive, but the reaction of the old county was fierce and the locals were in the majority. The uprising and takeover failed. Daugherty lost the senate by only 25 votes, carrying 80% of the Lexington Park district. There were no voting machines in those days and in fact a recount was called. But the re-counters were all of the old county. While some said it was rigged and that Daugherty had won the election, the recounters concluded that he lost, and declared Joseph Mattingly the winner. In that 1954 election, even though I was on the old county ticket, the slate of newcomers supported me for the House of Delegates. Because of the split between old and new countians and a heavy turnout in the Lexington Park district, I won. During the next four years I supported Lexington Park’s demand for better roads and schools to support the base. But I was not very successful, as neither of my colleagues, who were from Leonardtown, had much stomach for heavy spending in Lexington Park. In 1962, with the support of John Briscoe, Wilmer Bowles, Oliver Guyther, Elliott Burch, and others, I formed a full county ticket on a platform calling for radical change and the setting of new priorities. We campaigned on such issues as the building of roads, schools, and sewage systems. At the same time, a statewide movement began to eliminate slot machines in Southern Maryland. At the state level, support for this removal was based on the lack of progress in Southern Maryland and its dependence on the gambling economy. In addition, the Navy, while usually reluctant to take positions in local affairs, let it be known to county leadership that gambling and its social ramifications were adverse to further Navy investment in the Pax River base. The introduction of legislation to eliminate gambling incited strong political reaction. Elected representatives from the region worked out a development program that would provide state investment in this very isolated area of the state. We initiated expanded investments in education including the establishment of the four-year St. Mary’s College of Maryland; the development of Point Lookout State Park and the historic site at Maryland’s first capital in St. Mary’s City; new-and-improved sewage systems and roads; support for planning for a new bridge to be built across the Patuxent River between Calvert and St. Mary’s counties; creation of the Tri-County Council for Southern Maryland as the region’s planning and development organization; and the reorganization of local government. The state’s huge investment had an enormous impact on decisions made by the Navy, so much so that in the early 1990s, naval air programs were consolidated at Pax River, resulting in expansion of both facilities and personnel. This would not have occurred without the rejuvenation of Southern Maryland’s policies, politics, and investments in earlier decades. On Aug. 21, 2012, former state Senator J. Frank Raley Jr., 85, died at his home in St. Mary’s City. Sen. Raley’s passing closed an important, almost epic chapter in the region’s 20th-century political history. How important? The landscape Southern Marylanders experience traces its genesis to the efforts of Sen. Raley and his colleagues in and out of elected office. Improvements in the region’s roads, the construction of the Thomas Johnson Bridge, the introduction of land-use planning, the expansion of St. Mary’s College of Maryland, and the creation of the St. Mary’s City Commission and Point Lookout State Park formed the place we know today. Along with then-delegate John Hanson Briscoe and elected leaders from Charles and St. Mary’s counties, Sen. Raley worked to modernize the region, generate economic development, and raise the standard of living. These efforts set the stage for the region’s enviable record of growth. 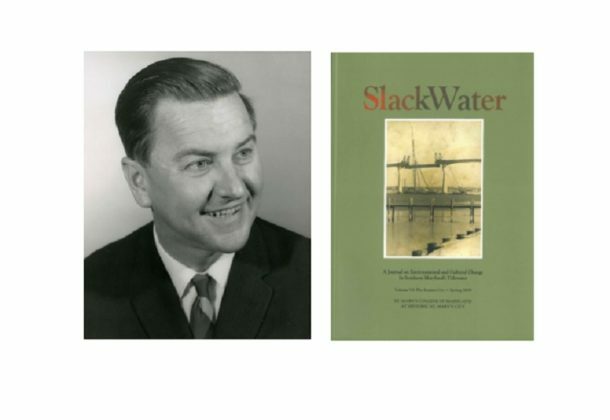 Read more at SlackWater’s online exhibit that pays tribute to one of the founders of modern St. Mary’s County.